Frederick Landis Fitzsimmons was born on July 28, 1901 in Mishawaka, Indiana. The right hander was known as a tough competitor, and famous for his knuckle curve ball. Although he wasn’t a strike out pitcher was one of the games better pitchers for the next two decades. He came to the Giants staff in 1925 pitching in ten games going 6-3. The following year he was 14-10 (10th most wins in the NL) with a 2.88 ERA (6TH in the league). In 1927 Carl Hubbell arrived on the Giants staff & the two made an awesome lefty righty combo on the Giants staff. 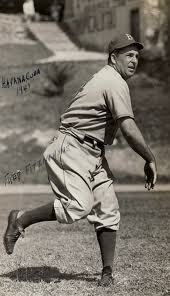 Fitzsimmons won 17 games going 17-10 paving the way for his best season in 1928. That year he went 20-9 (5th in the NL in wins) second on the staff to Larry Benton, with a 6.90 win % (4th in the NL) posting a 3.68 ERA, pitching 261 innings. In 1930 Fitsimmons led the league in winning % (.731%) going 19-7 (third in the NL in wins) with a 4.25 ERA. That year Hubbel & Bill Walker both had 17 wins. Fitzsimmons would win 17 or more games five times, posting double figures in wins twelve different times. In his nineteen year career he posted winning record fourteen times & had one .500 season. He twice led the league in shut outs, & one time each in starts, shut outs & earned runs. In 1934 he led the league in put outs for the fourth time setting the major league mark which was eventually broken by Cleveland’s Bob Lemon in 1954. He pitched for the Giants thirteen seasons, before being traded to the cross town rival Brooklyn Dodgers for Tom Baker in 1937. Pitching in Brooklyn firey team mate Leo Durocher said, “"I wish we had nine guys like Fitz. We'd never lose." In 1939 he broke Burleigh Grimes record of 74 double plays on the mound. Warren Spahn would break this record in 1964. He pitched there for seven seasons; having a fantastic 1940 where he was 16-2 with a 2.81 four shut outs, eleven complete games & a league leading .889 win %. In his time pitching in the NL he was the third most winningest pitcher in the league behind only Burleigh Grimes & Paul Derringer. Defensively he led the league in put outs four times, fielding % three times & assists once time. Post Season: Fitzsimmons got to three World Series winning his first one in 1933 while being on the losing end the other two times. 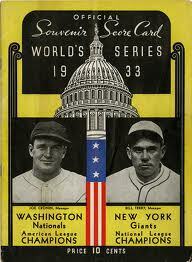 In the 1933 Series he took the Giants only loss in Game #4 to the Washington Senators. 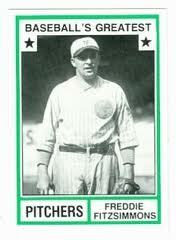 In the 1936 Series he took two more losses going 0-2 in that Fall Classic, allowing seven runs in thirteen innings pitched. In the 1941 Series with Brooklyn, he pitched seven scoreless innings matching zeros with Marius Russo but earned no decision in his only series appearance. In 1943 he was traded to the Philadelphia Phillies where he was named the teams manager right away, ending his playing days. In his nineteen year career he was 217-146 (80th most wins all time) with a .598 win % (125th all time) 3.54 ERA pitching in 3223 innings (98th all time) with 30 shut outs (130th all time), 186 complete games (161st all time)& 13 saves over 513 games, with 425 starts (95th all time). His 237 put outs are 47th all time, his 940 assists are 30th all time & his .977 fielding % is 33rd all time. Retirement: He managed the Phils through 1945, going 105-181 (.367%). In 1943 & 1944 he served as a Genral Manager for the Brooklyn Dodgers football team in the All America Football Conference. In 1948 he coached the Boston Braves, returning to the New York Giants as a coach from 1949-1955. He won two pennants & a World Series with the Giants serving as former team mate Leo Durocher’s pitching coach in that time. After his time as the Giants coach he went to the Chicago Cubs & Kansas City Athletics. Fitzsimmons passed away at age 78 of a heart attack in Yucca Valley, California. Fitzsimmons was inducted into the Indiana Baseball Hall of Fame in 1992.